The 2018 Minnesota Fringe Festival offered theatre history nerds a rare treat. The eclectic range of over one hundred and thirty productions performed during eleven days in August included Revolt of the Beavers, a theatrical chestnut often referenced in theatre history textbooks but seldom witnessed in production. Guided by playwright/producer Kit Bix’s adaptation of Louis Lantz and Oscar Saul’s 1937 original, the production team delivered a playful, anachronistic romp that reified the adage that what’s old is new. 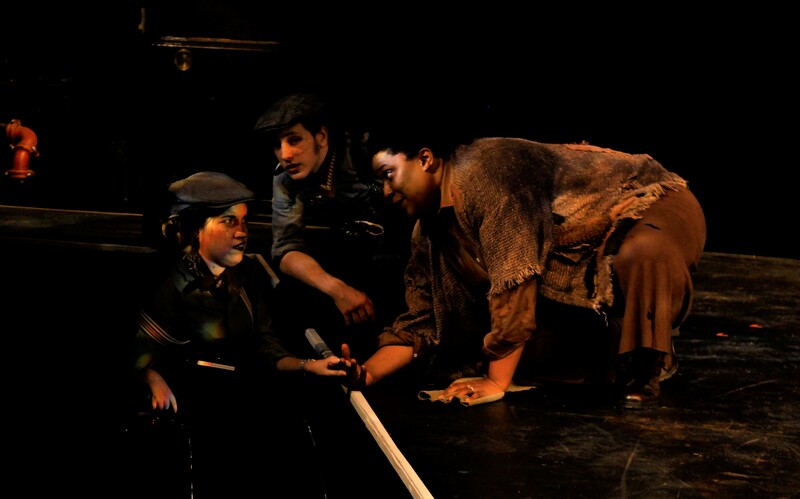 By reimagining this depression-era collectivist children’s theatre musical, Bix’s adaptation of Revolt of the Beavers lampooned political tomfoolery, promoted positive social change, and embodied diversity. Who knew a ragtag gang of beavers could be so wise? That same year, the House Unamerican Activities Committee (HUAC) publicly reviled Revolt of the Beavers—along with several other FTP productions—for promoting communist ideology. Under the direction of crusading Congressman Martin Dies, HUAC investigated the FTP, eventually calling Flanagan to testify at a congressional hearing. Just two years later, in 1939, budget cuts completely eliminated the FTP, thus killing the first and arguably most successful attempt to date of a national theatre in the United States. The play subsequently disappeared into the archives, seeing only a handful of productions in the past eighty-two years. Fortunately, Bix specializes in reimagining relevant—if forgotten—classics. Revolt of the Beavers followed up on last year’s successful Minnesota Fringe run of her adaptation of Sinclair Lewis’s novel It Can’t Happen Here, a theatrical version of which originally premiered in 1936 as part of the FTP. On the surface, a revival of It Can’t Happen Here seems more suited to post-2016 election than the more recent revival of Revolt of the Beavers. After all, Lewis’s political satire overtly portended the rise to the presidency of an unqualified, egotistical, would-be totalitarian narcissist. Sound familiar? All things considered, however, Revolt of the Beavers held up pretty well. Indeed, while perhaps not as overt an example of political prophesy, Bix’s clever adaptation provided a remarkable amount of wisdom for our current, turbulent times. Revolt of the Beavers. Left to right: Julie Dafydd, Emily Gustafson, Meri Golden, and Zach Holmquist. Photo by Christopher Mogel. Like Lantz and Saul’s much longer original version, the central conflict of Bix’s adaptation centered around worker’s rights. 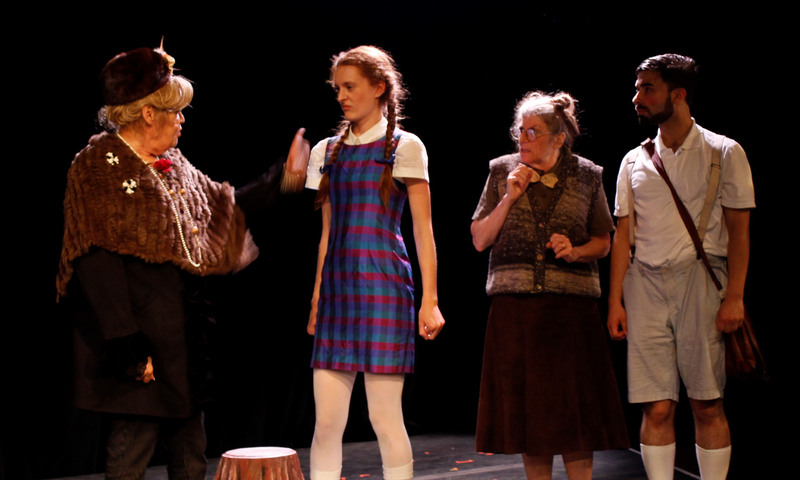 Two inquisitive school children, Kim and Paulo (Emily Gustafson and Zach Holmquist), joined the lovable Professor (Meri Golden) on a journey into Beaverland, a magical realm where every inhabitant was nine years old. While in Beaverland, Kim and Paulo encountered a desperate band of overworked and undercompensated beavers forced to toil long hours on an “industrial wheel” exclusively owned by their greedy manager, the Chief (Julie Dafydd). Led by a scrappy labor organizer, Oakleaf (Natalie Rae Wass), the beavers at first attempted to persuade the Chief to change her exploitative ways. She countered by firing all of the disgruntled beavers and hiring a destitute band of replacement workers. Undeterred, all the beavers eventually joined forces and revolted. After exiling the greedy Chief from Beaverland, the victorious beavers collectively assumed control of the means of production. Bix’s clever adaptation provided a remarkable amount of wisdom for our current, turbulent times. While obviously an allegorical take on organized labor strife in the early part of the twentieth century, this tale of unrest and revolt contained its share of contemporary parallels. Concerns over growing income inequality have persisted as a major issue for political progressives since the Occupy Movement through the campaign of Bernie Sanders, and up to the present time. Although not directly referenced, the Janice Decision—last summer’s anti-labor Supreme Court ruling—loomed over the show, having only become law a month prior to the Minnesota Fringe. Likewise, frequent reports of historically high numbers of our contemporary labor force barely subsisting under the burdens of an unsustainably low minimum wage provided contemporary subtext for the show. For today’s low-paid and under-protected workers and their allies, Revolt of the Beavers both reflected current struggles and encouraged future activism. Unsatisfied solely to focus on labor inequality, Bix’s adaptation bridged even further into our contemporary landscape. Unlike the 1937 original, Bix framed her version of the play with a congressional hearing in which Hallie Flanagan (also played by Meri Golden) articulately struggled to defend the FTP against pointed assumptions from Congressman Martin Dies (also played by Julie Dafydd). The subtext of Bix’s inventive theatrical frame resonated on multiple levels. First, the winds of history have not been kind to the HUAC; contemporary audiences therefore cannot help but associate Congressman Dies’ bombastic tirades in Revolt of the Beavers with the xenophobic hysteria that ultimately culminated in McCarthyism. Second, Bix’s frame evoked unpleasant comparisons to more recent public displays in which middle-aged white men have insolently interrogated highly accomplished women in suspiciously motivated congressional hearings. Although many examples of this sad behavior persist in recent memory, the sickening drama surrounding the latest Supreme Court nomination provides an unexpectedly timely but all-too-familiar equivalent. Revolt of the Beavers. Left to right: Adrienne Louise Kleinman, Henry Roach and Christy Johnson. Photo by Christopher Mogel. At this point, Kim wisely intervened, imploring, “You don’t need a wheel. You should tear it down immediately and go back to doing the work that nature set forth for you—by which I mean, building beautiful, artful dams.” After more heated debate, Kim eventually convinced the beavers that “felling trees with their teeth” and “building dams the old way” would increase worker satisfaction while restoring and sustaining the natural wetlands. Through her playful additions, Bix’s Revolt of the Beavers advocated for sustainable environmental practices that would restore and preserve the delicate ecosystems of the natural world. To their credit, this production team of Revolt of the Beavers moved beyond textual commentary and into more direct calls for political activism. To their credit, this production team of Revolt of the Beavers moved beyond textual commentary and into more direct calls for political activism. When the time came for Kim and Paulo to leave Beaverland, the Professor informed them that they could not return the way they came. Directing his focus offstage, the Professor stated, “You have to catch the wave.” Looking in the same direction, Oakleaf added, “Yeah. It’s coming. It’s really blue!” Another beaver then interjected, “That’s some big blue wave all right!” Of course, the pleased audience shared their appreciation for this political pun through explosive and supportive laughter. In addition to this direct plea for voter engagement within the script, the post-show curtain speech, a convention of the Minnesota Fringe, promised practical assistance in democratic participation. After thanking everyone for attending, the representative actor informed the audience that voter registration tables had been set up for them in the theatre lobby. Finally, the program included an announcement that 30 percent of the proceeds for the production would be donated to the American Civil Liberties Union (ACLU); considering the fairly large cast of professional actors, this contribution seemed generous. Through these direct appeals, Revolt of the Beavers actively encouraged participation in positive social change. Finally, the play exemplified its presiding theme of equality through its diverse ensemble. While the original script called for a large, heavily male, presumably Caucasian cast, director Shannon Twohy wisely chose to ignore these restrictions. In addition to including actors of color within the ensemble, the casting exhibited gender equality. In some cases, Twohy simply changed the gender of characters from male to female, as with the erudite Professor or the dastardly Chief. A more common practice involved casting and creating characters whose gender identity appeared more fluid. Among others, the performance of Oakleaf, the fiery leader of the revolt, embodied a non-binary approach to characterization. And Twohy’s penchant for inclusive casting went beyond race and gender. Double casting the roles of Representative Thomas and Birch (both played by Adrienne Kleinman) enabled a differently abled actor to play an important role in the ensemble. Because the thrust stage at Mixed Blood, where the production took place, was not accessible to Kleinman’s wheelchair, Twohy appropriately accommodated by staging significant portions of the action in the wheelchair-accessible audience, often shifting the playing space to the lip of the stage so that Kleinman could be fully included. Exiting Minneapolis’s Mixed Blood Theatre following Revolt of the Beavers felt more like leaving a political rally than an obscure example of depression-era children’s theatre. Bix’s witty reimagining of this rarely witnessed yet historically important plea for fair labor practices succeeded in entertaining and energizing its new audience. The 1930s merged with contemporary sensibilities to champion universal themes of justice, stewardship, and righteous activism. Here’s hoping that the big blue wave predicted at the end of the show will indeed carry these themes essential to human flourishing beyond the confines of artistic representation and into the public square.